I have a bachelors degree in fine arts. Even though I graduated what seems like a lifetime ago, many of my old drawings, paintings, and prints lurk in a basement closet. I recently framed a pair of lithographs to hang over the couch, and they are a delight. However, I live in a relatively small house and have no desire to upsize any time soon, so even if everything felt worthy of public display, I wouldn’t have space for it. Some of my paintings are so big, I’m not sure I know anyone with a large enough home to accommodate them. I’m interested to know what other former art students have done, and what suggestions you may have. Jaclyn, I found an informal online poll on DeviantArt, a social network for artists and art enthusiasts, that might pertain to your dilemma. The majority of the responders kept all their old drawings and sketchbooks for various reasons: to see how their work has improved and evolved, to provide inspiration for new work, etc. For some, all this artwork serves the same function that diaries or journals might provide for other people — it’s an extremely sentimental record of their life. Why do you want to keep them? If you’d like to display at least some of them, perhaps you can have more of them framed and rotate them out. For smaller pieces you could consider the dynamicFRAMES mentioned here on Unclutterer a number of years ago. If you want them for the reasons those other artists listed, you could look for good storage tools that allow you to easily look through those items whenever you wish. For large drawings, you might want a flat file, a mobile trolley, or something similar. For canvases and framed artwork, you could use a rack that keeps those pieces upright. I’ve listed a number of other options for storing large pieces on the Core77 website. If you want the personal history but feel less attached to the pieces, you might be okay with scanning or photographing your artwork and then letting the originals go. Scanning or photographing your favorite pieces might make sense even if you keep the originals, as this helps ensure you don’t lose the entire record of your work in case of fire, theft, water damage to your home, etc. If you have smaller pieces you enjoy looking at but wouldn’t necessarily want to display, you could put some of these on the inside of cabinet or closet doors. I’ve done that with various pieces of art (not my own), and it makes me smile every time I open one of the doors. How do you feel about giving away some pieces? I don’t know if these are anything you could sell (or would want to sell), but someone I know who was in a similar situation sold some of her work on Etsy. There are also a variety of ways you might give them away, beyond just offering them to those who’ve expressed an interest in specific pieces in the past. For example, if you’re on Facebook, you could post photos and ask your friends if they’d like any of them. And if you’re okay with strangers owning some of them, you could try offering them on your local freecycle or Nextdoor group. I’ve successfully freecycled artwork in the past, although not specifically student drawings, and the prior owners have been happy to know the art is going to be displayed and enjoyed rather than tucked away in storage and never seen. Why am I keeping this item: for practical use, for decoration, for sentimental reasons, or something else? What’s the best way to store it, to ensure it serves that purpose? Would keeping a scan or a photo work as well as keeping the physical object? What ways of selling, donating, or giving away something I decide not to keep would make me happy? Regular readers of the site know that I have a special place in my heart for infomercials. There are so many reasons to love them: the horrible acting, the ridiculous products they advertise, and (my favorite) the depictions of the horrible life one must endure before acquiring the ridiculous products. Reader JJ’s loft is overflowing with her four children’s old things. She is finding it hard to let go of anything, even the clutter. Joseph Joseph’s Nest 8 collection of nesting kitchen items is a fantastic way to save space in your cupboards. Being an unclutterer doesn’t mean you can’t or shouldn’t have collections — but it does mean taking an active role in ensuring your collection doesn’t become clutter. When I read Bezos’ apology, I was impressed by how direct, sincere, and uncluttered it was. The Rubbermaid company offers some terrific advice on their website for sharing a bathroom in their Back-to-School section. 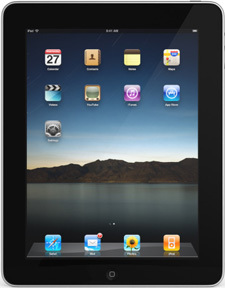 It’s amazing to think that Apple’s iPad turns five years old this year. It’s so ubiquitous in 2015 that it seems like it has been around for a lot longer. Even old models are still in use, which brings me to my motivation for writing this article. I own an iPad 2. It was released in March of 2011 and it’s still alive and kicking. Apple has even noted that the next update to its operating system, dubbed “iOS 9”, will run on the aging device. Still, it’s not as zippy as its younger siblings. If you’ve got an older iPad around and have been wondering about its usefulness, let me point out these great ways to keep it useful and in service. The following are four ways to use an older iPad. Don’t want to cut the cable cord? Or maybe perhaps you prefer to enjoy TV and movies on your actual television? No problem. Most TV manufacturers offer universal remote apps. Additionally, if you use the Apple TV, there’s a free Remote app ready to go. It might not fit into your “Remote Boat,” but the iPad does a good job of controlling your TV. And it reduces clutter by limiting you to one remote instead of a pile. A friend of mine has this super-cool wireless weather station at his house that I really like. Realizing that an app is cheaper than a whole new piece of hardware, I went looking for a compatible app and found WunderStation. This great-looking app provides a wealth of weather information that you can browse in real time. You can also customize its presentation so that it’s displayed just how you want. Add a handy wall mount and you’ve got a very cool weather station. I’ve been using my iPad in the kitchen pretty much from day one. Of course it’s great for storing recipes and keeping them handy for when you want to cook. 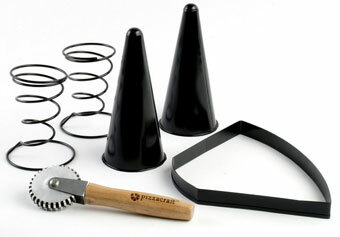 But you can increase its usefulness with a kitchen-friendly stand. I use a ‘fridge mount from Belkin to keep my iPad 2 away from messy spills while I’m cooking. Alternatively, you can use a Chef Sleeve or go low-tech (but just as effective) with a zip-top kitchen bag. It’s funny to think of something that’s only five years old as near the end of its usefulness, but such is the nature of tech. However, I think the iPad is an exception. The usefulness for this device has certainly exceeded its cost at this point, and I plan to use it for many more years to come. Many people have mindless activities they engage in when they need to think. Some shoot hoops, others go for a walk, and I shuffle cards. I keep five decks of cards at my desk for the sole purpose of giving me something mindless to do when I need to formulate a post idea, work through a problem, or figure out whatever it is that has me stuck with my writing. I know I’m not alone in my shuffling (or walking or hoops playing) or really wasting time, because scientists have found that a little mindless activity actually enhances creative work. We’ve talked in the past about filing being a good mindless activity to let you accomplish a to-do item on your work list, while not focusing on mindful work. Scanning, sorting, and shredding are other mindless, yet productive tasks. Shuffling cards doesn’t help me get anything else off my to-do list, but it certainly helps me think and solve my work problems, so I’m not about to give it up. What mindless activities do you do to help you think and enhance your creativity and overall productivity at work? Also, how do you organize any stuff related to your mindless activity? Alternating between mindless and mindful activities is great, so if you don’t do something right now, check out comments from our readers to see if there might be a mindless activity that is perfect for you. When uncluttering your home and office, chances are you’ll come across many objects you’ve thought about getting rid of dozens (maybe hundreds) of times, but never did. Ask Unclutterer: Best methods for recycling? I recycle almost everything. In passing magazines along to a charity, is it much more likely they will end up in a landfill? I want to put together a bar in my dining room, but I want it to be a gentleman’s bar not something I would have done in college or a kegerator. This weekend, give your nightstand a little attention and see if it can use some uncluttering love. There’s abundant advice, here on Unclutterer and elsewhere, on overcoming procrastination so incomplete work gets finished. But in some circumstances, the best approach might be to forget about completing certain things. I’m in a book club that’s been meeting for years, and I just finished our latest selection — a book I really enjoyed. But I haven’t enjoyed all of our choices, and when that happens I just stop reading that month’s book. Fortunately, my book club still welcomes me to attend the meeting, and it’s interesting to hear the different reactions. Even if those who didn’t finish the book were not welcome, I’d still give up on the book. Time is such a precious resource, and I’m not going to spend my limited reading time with a book I’m not enjoying. If you feel guilty about abandoning a book, it might help to know that some authors quickly give up on books that don’t grab them. Eleanor Brown doesn’t finish about 20 percent of the books she starts. She stops as soon as she’s no longer interested, which could be on page 2 or page 150. John Scalzi writes, “I put down books the instant they bore me.” As Laura Miller notes in a New York Times article, Michael Chabon gives up on books after just a page or two. Myla Goldberg goes a bit further, but still only gives a book 15-20 pages to convince her it’s worth her time. I make similar choices when it comes to reading news stories. I’ll sometimes begin an article and realize I don’t feel a need to know anything more than what’s in the title, or maybe the first sentence or first paragraph. Or sometimes I begin a long feature article I thought I’d enjoy, but I don’t. In these cases, I stop reading the article and move on. It’s also fine to give up on a movie, although you’ll want to be considerate of others if you’re watching in a theater rather than at home. (It’s easier to leave if you’re on an aisle than if you’re in the middle of a row.) And you might decide to stop watching a particular TV show or to abandon a weekly show mid-season. I also see lots of people with partially completed craft projects that got set aside many years ago. When Susan Reimer of The Baltimore Sun asked people about long-unfinished craft projects, she got stories about a dollhouse kit that had been unfinished for 27 years and an unfinished sampler that got moved to eight houses. The same thing can happen with woodworking projects and other such activities. If the person no longer has any real interest in completing that project, for whatever reason, it makes sense to just let it go. It can be a relief to acknowledge a project is not going to happen and to dispose of the supplies set aside for it by selling, giving away, or repurposing them for more compelling projects. There have to be a minimum of five thousand calories in one of those things, right? 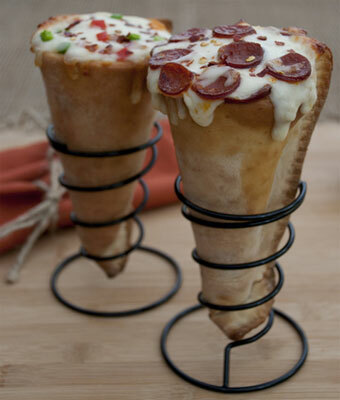 Can a single person even consume a whole pizza cone without their stomach exploding? Wow. Thanks to reader Niagra for finding this set for us. It’s something. It happens to the best of us. At some point or another, your motivation will seem to dissolve in thin air. Here are ten strategies you can use to get back on track and get things done. Over the years of writing about organizing and working with clients, I continue to be baffled by how to neatly organize a small number of items. Whenever I see these items or hear about them, I cringe. Organizing them successfully is a complete mystery to me. Maybe you have a few, too, in your home or office — a specific item that always seems to be out of place, cumbersome, or impossible to store well? Since most of us spend time at work dealing with facts and data, the phone should be taking a backseat to other forms of communication. That being said, it’s impossible to avoid the phone in the workplace. And there are times when picking up the phone is the best way to handle a situation. The following are suggestions for how to use the phone in an organized way during those times when you need to rely on it. Interesting products and articles related to uncluttering and organizing. If you use your basement for storing things other than root vegetables, let me introduce you to my Three Laws of Basement Storage. If you don’t immediately process your mail when you come home each evening, then I strongly recommend having a set place to store your mail until you do have time to process it. Ah, summer. Those three balmy months when school is out and many people are spending their vacation time. It’s great to get away and relax, and potentially tricky to work with collaborators. Instead of playing phone tag — or worse, email tag — consider some of these fantastic online tools that let everyone you wish to participate in a meeting list their schedule availability. 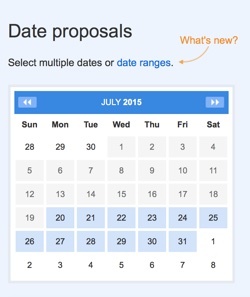 A long-time favorite of mine, Doodle lets you pick several potential dates for your meeting or event and invite others to check off what works for them. Once everyone has participated, it’s easy to see what’s going to work and what isn’t. Doodle is free to use, though a paid option is available, which includes a custom domain, custom design options and more. But for quick-and-dirty scheduling, the free version works perfectly. ScheduleOnce is another option with a very nice feature: Google integration. Once connected to Google Calendar or Gmail, ScheduleOnce will populate those tools with the scheduling information added by your participants. That means one less step in the process of getting your meeting arranged. I like that. I like the robotic name of this app: Schedule Thing! It’s not science fiction, it’s a scheduling application that makes use of what it calls “resources.” A resource can be just about anything, like a meeting space or a person. List when a given resource is available, and then participants click on the option that works for them. After the initial setup, Schedule Thing can save you a lot of time. I love When is Good because it’s super simple and completely free. When you create an event, you highlight or “paint over” the dates and times that work for you, as they appear on a grid. Save the unique URL to share with the rest of your group, as well as the unique results code. After everyone has participated, return to When is Good, enter your results code, and view compatible times in an easy-to-read grid. Like I said, it’s free and very easy to use. Services like these aren’t unique to work situations, either. Perhaps you’re looking to schedule a fishing trip, a day in the city, or an afternoon at the lake with friends or family. Accommodate everyone’s busy summer schedule by letting them answer your request for info when they can. It’s convenient and easy. Many years ago, I worked as the IT director for a school here in Massachusetts. It was a multi-faceted job that included maintaining a file server, a backup server, well over 100 machines and, finally, a help desk for about 125 people. I have some amusing stories from those years, as well as an important lesson: never have a single point of failure. Redundancy was the name of the game in my previous job. For example, our file server was connected to something called an “uninterruptible power source,” or UPS. A UPS provides electricity in the event of a power outage. That way, if a storm knocks power out, I still had time to get to our computers and shut them down properly. I also ran a backup server that saved its daily and monthly backups to several locations. If one of those backups failed for whatever reason, I could rely on one of the alternates to provide what I needed. What does this have to do with daily life? Plenty. As Leo Babauta once said on Zen Habits: “I’ve seen people pay $1,000 to hear speakers at a conference and only have one pen to take notes.” If that pen breaks or runs out of ink within the first five minutes, you’re out of luck. The simple act of bringing two or even three pens can eliminate a potential problem. More than one flashlight. Here in semi-rural Cape Cod, we lose power at the drop of a hat. Keeping three inexpensive flashlights in the closet eliminates some stress. Car keys. Most new cars are sold with a pair of keys. But that’s not always the case with used cars. If you’ve only got one key, spend the money to get a second. Charger cables. These things aren’t really built to last longer than a couple of years it seems, yet we don’t replace them until they become a frayed fire hazard. Keep a fresh one in a drawer so you can swap it out with the original before plugging it into the wall becomes an act of pure optimism. Additionally, having multiple charging cables in different locations (such as one at your home, one at your office, one in your briefcase) means that you don’t ever have to worry about forgetting a cable when you need it most. Important documents, like birth certificates, marriage certificates, social security cards, etc. My practice is to put the originals in a safe deposit box and keep photo copies on hand. If I lose/damage the copy it’s no big deal, and I can always retrieve the original if I need it. Make a list of the single points of failure in your life right now, and see if you can fix them. Someday you might be very glad you did. This week has been incredibly exciting in our Unclutterer world and I’m eager to share the details: a new book is in the works and Erin is featured in the August issue of Real Simple Magazine. These packing recommendations will help you make the most of your trip to Orlando. According to a recent study released by the UCLA Center on the Everyday Lives of Families, U.S. families have reached “material saturation.” The back areas of our homes (closets, basements, attics, cupboards) are so stuffed with possessions that our things spill out into our front areas (table tops, floors, furniture) and create more visible clutter than ever before in the history of the world. We’re no longer enjoying leisure activities and our children’s stuff is at the top of the clutter pile. Backsliding happens to the best of us. Follow these three suggestions to help you get back on track. We often talk about the benefits of uncluttering and organizing, but we rarely even hint of their being downsides. Today, I thought we’d break that trend and discuss all the work that — at least in the short term — uncluttering and organizing create. The August 2009 issue of Real Simple magazine (pg. 36) has a great tip for maintaining order in the kitchen. Ask Unclutterer: Is something put away if it’s in cardboard? In your situation, one of you believes that the cardboard box is in its place against the wall and that the stuff inside of the box is in its place, too. The other of you believes that the cardboard box and the stuff inside of it are all out of place and they need new places to live. Published in 2006, this gem is essential reading for anyone who finds themselves in a cluttered kitchen of any size.